Who made who? I dig the 403 engine. I even love it when others openly loath the underdog right to my face when I am standing by the open hood of my 1979 Trans Am. So it was big and slow and needed unavailable (at the time) and costly (even now) performance upgrades. That is fine, those upgrades can be done with the help of Edelbrock and Mondello. That is correct. Mondello. The Oldsmobile specialist. 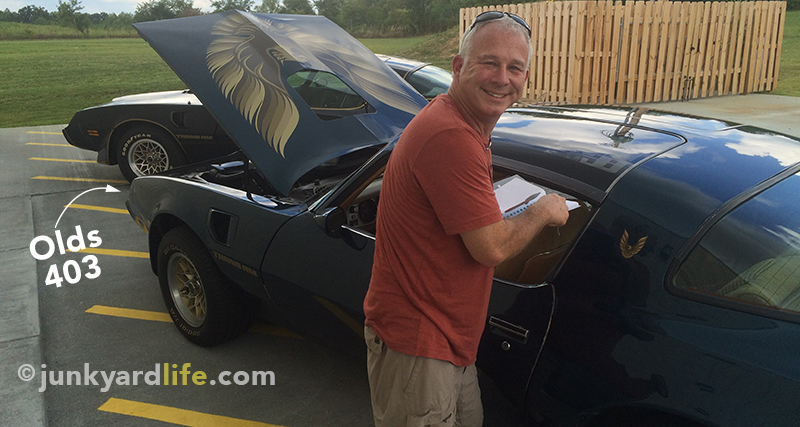 Pontiac did not make the drivetrain in my Trans Am. It is not a true Pontiac engine despite being installed in the car when it was built in Norwood, Ohio. Pontiac borrowed my motor from Oldsmobile. Is that such a bad thing? The Olds 403 engine gets no respect because of its cross-breed origins. 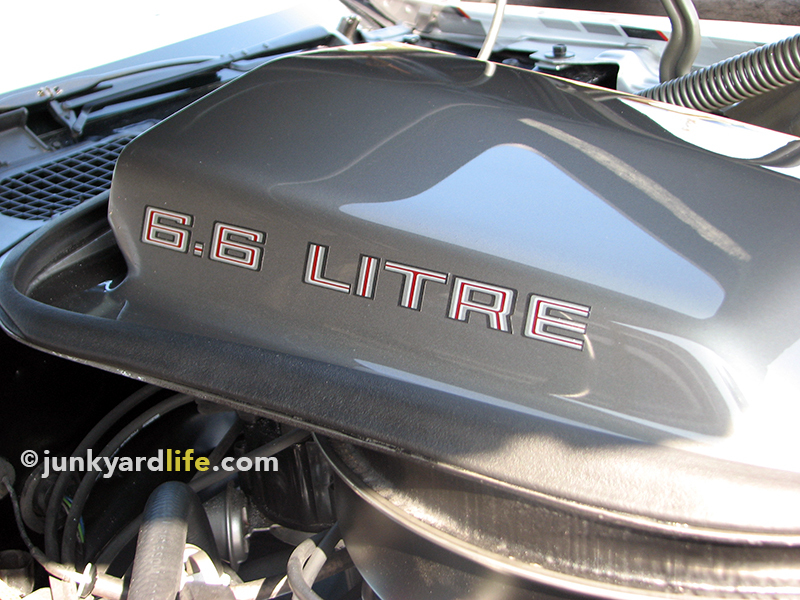 6.6 litre decal denotes the Olds 403 engine on Pontiac Trans Ams. What On Earth Are You Talking About, Willis? “It most certainly does not!” Okay, now you have done it. You have gone and slapped a loyal Cadillac buyer with his own driving gloves. This was a Cadillac guy and not an Oldsmobile guy. Now you tell him. Now, after the sale. After he has paid a considerable amount more for the Cadillac, only now do you tell him he has an Oldsmobile. If he wanted an Oldsmobile, he would have bought an Oldsmobile. The litigious battle ensued and the higher courts saw it his way. He was misled by some degree and a higher end automobile was misrepresented to the buying public. As it turns out, not everyone loved Oldsmobile the way we do here a Junkyard Life. Recently, I ran across a back issue of Hemmings Classic Car and I found another spin on the story. The wonderful article by Bob Palma, who is one of my favorite columnist, told us in facts and used names! The victim and hero of this story is a gentleman named Joseph Siwek. Like us, he was an Oldsmobile guy. So he buys a new 1977 Delta 88. To reiterate, we keep talking of Pontiacs and Cadillacs that had Oldsmobile engines in them. So, this was an Oldsmobile and probably has an Olds engine between the fenders, right? 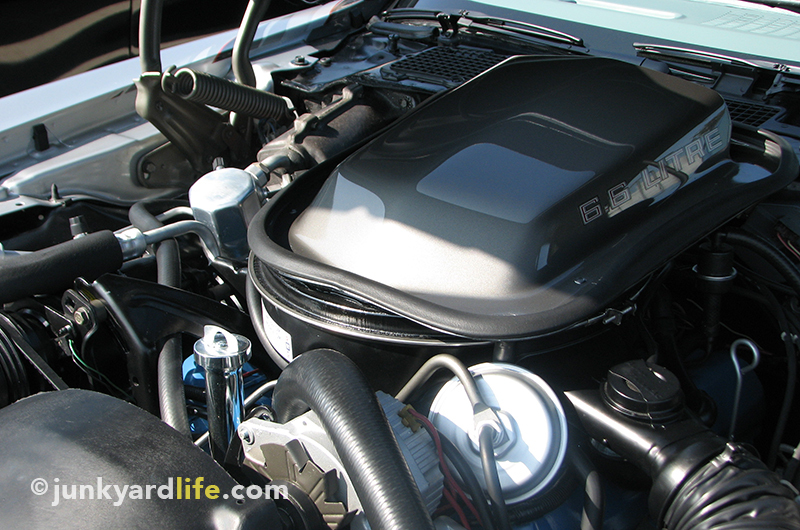 Oil fill tube located on front of engine and makes identifying a 403 engine in a Pontiac easy. synonymous with Oldsmobile engines and it doesn’t fit. He lowers the car to get a better look at the VIN code, and it even says “Rocket” on the air cleaner like a proper Olds should. For those not in the know, “Rocket” had been a marketing success for Oldsmobile and could mean many things to a car guy. Mainly, it always had been safe up until now to assume your blue GM motor was an Olds. The filter for the true Olds would not work. Try the one for the Chevrolet! Mr. Siwek indeed had a very traditional, dependable, garden variety small block Chevrolet. It wasn’t even wearing little bowties. Junkyard Life surmises that this engine was even further disguised as it was probably painted the corporate blue that GM had mandated all its power makers to be painted. Unless you bought a new car within the last year, you probably had seldom seen a Chevrolet painted blue. Those were supposed to be orange. Oldsmobile made a blue, so it made sense. It made sense until the customer was called out and things didn’t go so well. Mr. Siwek refused to be a part of this engine identity crisis. General Motors had been caught swapping. These once exclusive engines now went to anyone. What once had been sacred had now become a cross breeding love fest blending various GM divisions for power. 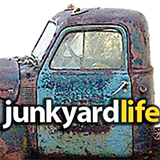 (Editor’s note: The words “cross breeding love fest” have never been mentioned in a Junkyard Life article ever before. Those are Ron’s words and definitely not the words of one of our favorite columnist Bob Palma) Mr. Siwek called the Illinois Attorney General and prompted the largest class action lawsuit GM had ever seen. Extended warranties and $200 rebates squeezed around $40 million from the large automaker. It was also mandated that information of this practice was to be disclosed in sales literature, ads and brochures. 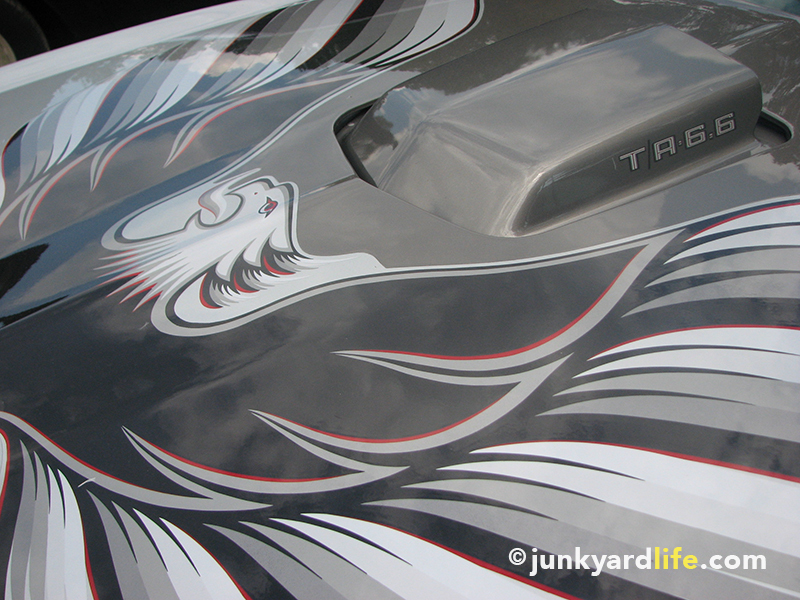 T/A 6.6 decals were applied on the shaker hood scoops of Pontiac 400 equipped Trans Ams. But Why? Why O’ Why? Cadillac. Had that motor been mass produced and divvied out, would that have been a game changer? We have seen a few Olds motors that made their way into trucks after the fact. That makes sense, for they had loads of usable torque at low RPMs. Fear not, Oldsmobile, for we love the 403. Or at least I do. The 403 was introduced in 1977 for larger cars to actually move themselves during an era of strict emission laws and fuel consumption standards. The 403 should have won the hearts of many since most of the 1977 Trans Ams from Smokey and the Bandit employed them. The top dog 400 Pontiac motor received most of the notoriety. 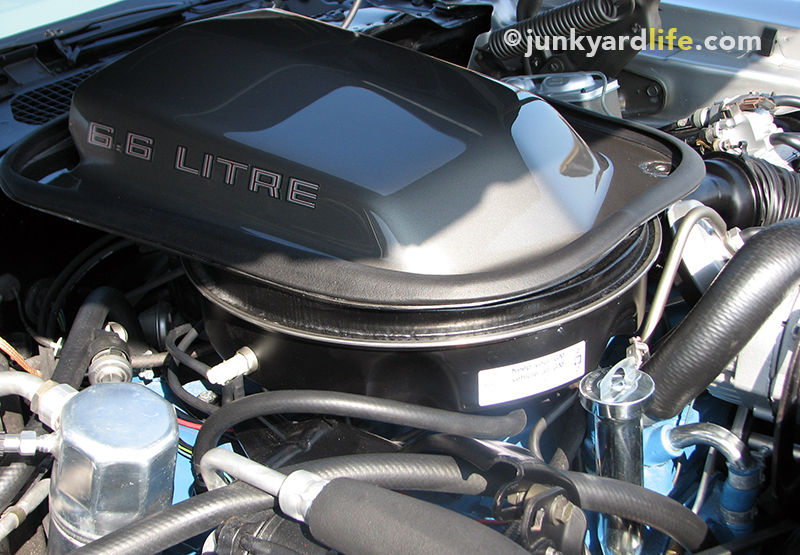 Look closely at The Bandit’s car and you will see “6.6 Litres” on the shaker scoop. The 400 would have said “T/A 6.6”. The 403 despite having a piston wider than a 454 Chevy, it is still based on the small block Olds. For you specs fans-Chevy 454 had a 4.250” bore. The 403 had a 4.350”. That is a lot of piston for a small block. The 403 was advertised as being lighter than previous motors. In the 1977 Cutlass 442, it was called “The lighter weight Rocket”. The 403 was also popular with the Buick division and used in their Electra 225 even through 1979. Lynn Welfringer at Mondello Performance Products recently told us he does a piston change, raising the low compressiom to a healthy 9:5 to 1, a camshaft and lifter change to their own JM2022 or even the 2225 cam, 60 cc aluminum heads with an aluminum Cometic head gasket made especially for the 403 and don’t be surprised to see 400+ horsepower. Their knowledgeable and experienced Oldsmobile talent can be reached at (805)-237-8808. Joe Mondello once noted the 403 Olds as being an overlooked performance engine and somewhat of the “unsung hero”. When really thinking about it, how many Olds 403’s have you seen torn up or prematurely worn out? They really were hard working , long lasting and truly deserve more credit than they get. The Oldsmobile 350 was actually gold and the 455 Olds was blue. Pontiacs were also blue albeit a different shade. When GM declared their “corporate motors” to be blue, this included Chevrolet’s 305 and 350, as well as the Olds 403. That really doesn’t bother me on the 403, but I feel a Chevy block must be orange.